I am not sure about you but I am still scratching my head wondering what the hell happened to October? Thanksgiving is already next week! I wish I could slip a couple of extra weeks back in before the Holiday season kicks in to full gear. Alas it is only a wish and I suppose I have to buck up and just go with it. I was able to get a little down time (a day) after my show but I am now back in the studio daily, from here on out until Christmas. I have orders, man do I have orders to fill and I am wondering how I will ever manage to pull it all off. I have been having a lot of loss in the kiln lately which is anything but good. I have this order for a a set of twelve plates, a large platter and a large bowl. Half of the plates have peeling issues and the platter though it is perfect on the front and looks wonderful, on the backside, the glaze puckered and peeled. So I have to start at square one and remake all the work. I have been doing a lot of thinking lately about the feasibility or better yet the sensibility of making a living from my ceramic work. I know it looks as if I might be getting rich off of my work. My prices may seem to suggest it but the truth of the matter is that I lose so much of it and spend so much time remaking work that already takes a tremendous amount of time to produce the first time around, I am lucky if I am even breaking even. I feel as if I am constantly swimming against the current. There aren't any easy solutions or quick fixes. It is simply just the way it is. 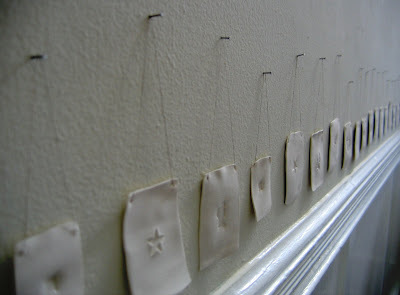 So in a quiet moment I returned to making my porcelain tags (which I have been making on and off for years now). They are simple and straight forward, no glaze, just very thin porcelain, stamped with a lead letterpress stamp (I have a large collection of letterpress images) and hung on a simple thin thread of linen. Something that I don't have to struggle with and that gives me some immediate gratification with a medium that is anything but immediate. I wanted to share the quiet moment with you. If you would like one for yourself they are available here. I see you only have 7 left ... and I must run out the door ... hopefully some will be left when I get back from a few hours, maybe overnight, of not getting back here to buy. But, it seems like no worries because you make them frequently? In any event, yes, October did not really happen and the labor of your work is truly stunning. i here ya sistah.....i've been experiencing the bubbling glaze on large and otherwise perfect platters lately. so very frustrating. and it only happens on large flat things, right ? UP THE PRICE ! p.s....is it not october anymore ???? Good luck with your technical difficulties. I love the letterpress tags. Have you thought about putting your glowbowls on etsy? I love your asthetic. The tags are perfect. thanks, perfect girl, lylou and jeanette! rae, i know you share my pain...whats up with the platters? lisa, unfortunately the said platter is for an order so it has to be perfect. You know, I have half the work going that you manage to produce and I ask myself the same question every so often. Sometimes, I think I'm a little OCD, or maybe it's an addiction or I'm a masochist or maybe suffer merely from a compulsion. Whatever it is, it is our calling. i really love to read your honest accounts of making a living as an artist. it's very interesting an inspiring. i love the porcelain tags, they're like classy christmas ornaments.